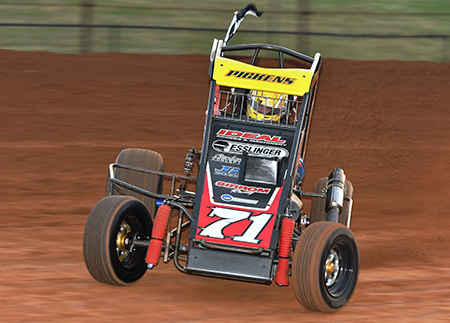 It represents the best of the best out of the Shaky Isles as they take on the Aussies not only for bragging rights in the Trans-Tasman Challenge, but also the time honoured New South Wales Speedcar Championship and the annual Sydney City 50-lap Classic. Michael Pickens, Brad Mosen, Chris McCutcheon, Leon Burgess, Caleb Antonio-Rooney, Hayden Williams, Hayden Guptill, James Earl, Jayden Worthington and Peter Hunnibell will contest all three events. Taylor Clarke will be the eleventh Kiwi to join the starting line-up when he contests the Sydney City 50 lap Classic on May 4 as defending titleholder driving the NSW #67 for NSW car owner Gavin Wesble. The Kiwis are coming to win and hell bent on showing the Aussies the quickest way around the super-fast, high banked Valvoline Raceway oval. These Kiwis do fly and the interest surrounding the appearance of the NZ contingent is incredible. These annual season events for the Mighty Midgets are taking the division to another level in Sydney. The racing will be fierce as the traditional Trans-Tasman rivalry between Australia and New Zealand explodes on the track. It sets the scene for a super showdown involving the superstars of Midget-Speedcar racing in this part of the world. “We are very excited to have such a great line-up of New Zealand drivers for the three big races, taking on the big names in Australian Speedcar racing. It promises great entertainment with superb action and thrilling racing,” Valvoline Raceway Principals Barry and Felicity Waldron said. Nathan and Harley Smee, Adam Clarke, Kaidon Brown, Matt Smith, last start impressive Valvoline Raceway feature race winner Darren Jenkins, Troy Jenkins, Braydan Willmington and Matthew Jackson spearhead the Australian challenge. Darren Jenkins was superb as he raced to victory in the main event at Valvoline Raceway on April 13 and had the car working perfectly. In a good pointer to the form guide, he will certainly come into strong calculations. Darren obviously found the correct set-up and was a comfortable winner in a solid hit out. Photo: Michael Pickens in action at last year's Speedcar 50 Lapper at Valvoline Raceway.